Too well designed, useful and sonically impressive to warrant a lower score, but not the most original-sounding plugin. Well chosen effects. Clear layout. Awesome arrangement tool. Great randomisation options. Sonically nothing new. Quite pricey. Sugar Bytes' latest plugin (VST/AU/RTAS/AAX) and standalone effect, Looperator, is effectively two audio processing tools in one: a loop slicer and an effects sequencer. The loop slicer comes first, chopping the incoming audio into 16 steps. The step resolution can be set to half-, quarter-, or eighth-notes, and while we'd have liked the option of 16ths, judging by how successful the rest of the plugin is, we guess Sugar Bytes just decided it didn't work. "For every step of the sequence, each of the five effects channels can be set to trigger one of 20 presets or four user settings"
Below the slice Input lane is a six-track sequencer, which controls Slice playback and five effect channels. The signal flow through the modules is re-ordered by simply dragging them up or down. The Slice track controls which slice is played back on each step. With simple one-bar percussive loops, this isn't so exciting; but as soon as you apply it to something that varies as it progresses - a musical riff or vocal sample, for example - it becomes a whole lot of fun. For every step of the sequence, each of the five effects channels can be set to trigger one of 20 preset or four configurable User settings. The presets can't be adjusted but are carefully designed to deliver always-useable results, while the User settings open the effects up to manual editing, including various modulation options. The FX 1 and FX 2 tracks host multieffects presets covering familiar processors like Reverb, Delay, Vinyl, Tape Stop, Distortion, Tonal Delay. Phaser, Pitch Shift and Half Speed. The User settings expand the list to include a synthesiser, ring modulator and more. The remaining three tracks are Loop, Envelope and Filter. All three are useful and interesting - with filter's various types including a vowel filter, and the envelope shaping effects handling everything from gating to subtle pumping - but we think it's Loop that will appeal most to electronic music producers, as the preset steps facilitate incredibly fast creation of the kinds of snare rolls, double kicks and stutter edits that can otherwise be fiddly to program. In this respect, Looperator is a powerful, intuitive solution that could find a place on just about any dance track. Like all Sugar Bytes plugins, Looperator comes with a tasty selection of presets, which make for are a great place to start. There's also MIDI note or Program Change input for quickly calling up patches from a user-constructed 'favourites' list. Naturally, you won't always want the fully wet effect all the time, and Looperator offers individual Wet/Dry controls for each track, as well as a multimode (Mix Linear, Mix Equal, etc) wet/dry control for the output. On balance, it must be said that Looperator isn't the most original plugin we've ever come across, but rather a superb evolution of Sugar Bytes' other glitch plugins, Effectrix and Turnado. It's certainly the first that makes incorporating the results into a broader project a truly effortless process. 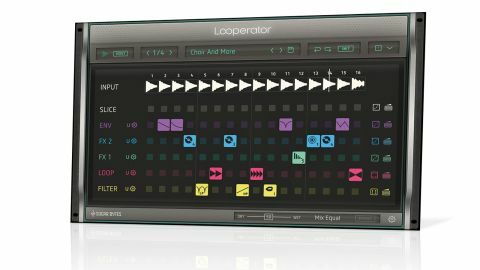 Looperator doesn't boast the widest range of effects, and it has a very definite sound, which will affect its shelf life, but we recommend it to any connoisseur of loop slicers and glitch effects. Indeed, the speed with which it can be used to create builds and edits (in both individual tracks and full mixes) should make it a go-to tool for any electronically minded arranger.